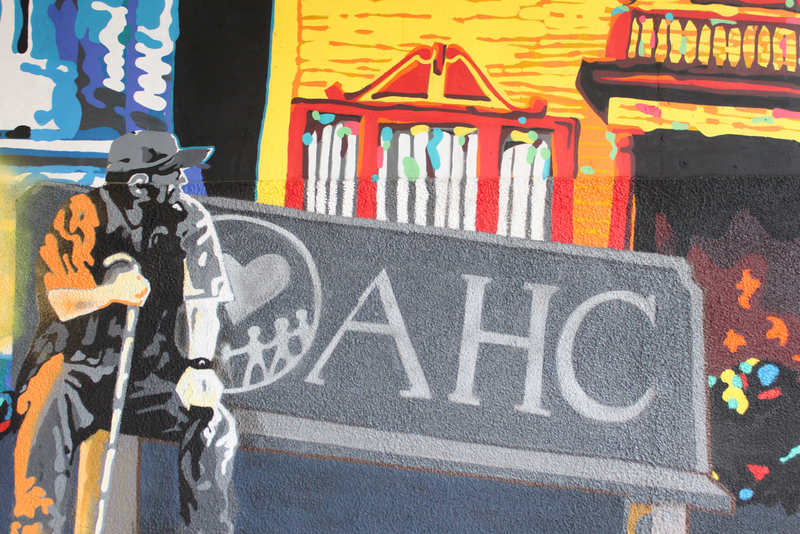 The Attitudinal Healing Connection of Oakland (AHC) is a 501(c)(3) non-profit that inspires and empowers members of its community through the arts, creativity and education. Established in 1989, AHC encourages individuals to use self-healing tools, practices and concepts to transform their lives and make positive choices to break the cycle of violence for themselves and their communities. The organization offers programs for all age groups in personal development, community leadership and the arts to cultivate creative expression and communication. AHC’s ArtEsteem program, established in 1995, was created by AHC Executive Director Amana Harris to integrate social justice and art education. Amana grew up in Oakland and saw a great need for healing from violence and racism. She saw art as a safe way to address these issues, as there were clinical and informal studies beginning to emerge based on using creative expression as a healing process during times of difficulty. She was also raising two daughters at the time, and wanted to help build a better future for them. 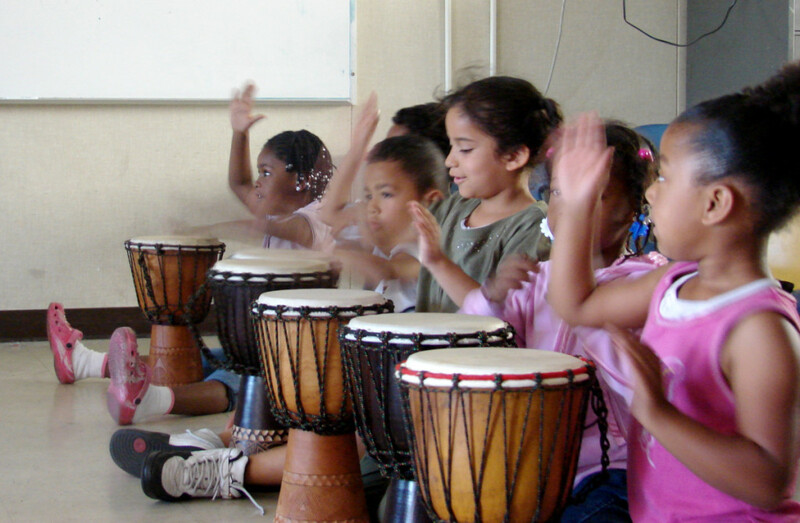 Children participate in a Mindful Drumming class as part of the AHC ArtEsteem program. Photo courtesy of AHC. ArtEsteem classes began as small workshops held in a tiny house-turned-office space (which, once upon a time, had been a haven for drug addicts, and then later a rehabilitation center). The ArtEsteem operation grew and extended to school campuses for after-school programs. “There are classes in visual arts, cultural arts, fashion, architecture, photography, outdoor learning — a multitude of creative channels in which to learn and express oneself,” says Erica Wheeler-Dubin, AHC communications manager. There are even drumming classes for children, started by AHC co-founder Kokoman Clottey from Ghana, as part of a program for healing through rhythm and vibration. Erica says students often come back as counselors and leaders. The ArtEsteem alumni, she says, “reflect on the impact of the program and the impact of art on their lives, and they are socially responsible, aware, and have deep ties to the program.” The goals of the program are community-building and relationship-building, and it’s evidently working. These individuals’ need to pay it forward and give back to the community that has impacted them so deeply is the result of that strong community. “The ArtEsteem program has even helped kids get into college,” Erica says. Another program under ArtEsteem is the Oakland Super Heroes Mural Project; its third installment was 114% funded on Indiegogo earlier this month. The project started as a Visual Arts class at McClymonds High School in West Oakland, in which the students drew themselves as superheroes. As their alter-egos, they had to identify problems in their communities and come up with ways to solve them. This empowered the students to see themselves as heroes. “With their creativity, they saw themselves as active change agents in their community, and were learning visual arts in the process,” Erica says. The students are engaged from the beginning of the process. They learn the legal procedure of getting public art up professionally by submitting their design to the City Council for approval. Once approved, a lead artist works with the 25 students, a group of student-leaders, and mural artists help the students paint the mural over the course of a month. These murals address problems in the community where they are being put up. The team works together to beautify a 3-4,000 square foot wall surrounded by a neglected area where there’s rubbish, scarce street lamps and crime. But when the students see their characters in large scale up on that wall at the revealing event, they see themselves as the heroes responsible for beautifying and improving their community. AHC also has a unique program in leadership training with Oakland Housing Authority Section 8 residents. As community leaders, participants address issues and problems in their community and implement their ideas for change. If you’d like to learn more about The Attitudinal Healing Connection of Oakland and ArtEsteem, visit ahc-oakland.org.